B"H today I came back from three days on Sharon's Nanach van. What a zichus (merit) to partake in this awesome hafatza. Just driving down the street stirs up and invigorates the life pulse of our brothers slaving out there (see Likutay Moharan Tora 56, regarding the pulse, this is caused by sighing, in Tora 8 Rabbainu teaches that sighing invokes the Tzadik to restore all that is deficient). 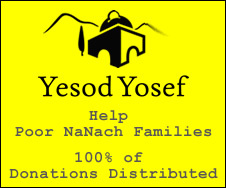 During hafatza simple Jews who have difficulty even doing basic devotions show their true color pumping NaNach into the bloodstream of the world. Jumping out of the van to dance at any opportunity; singing and dancing. Yesterday we had to make a stop in Bney Brak and instead of playing regular music, humble me (as Shlomo Carlbach would refer to himself) took the microphone and sang a bunch of my hit Yiddishe Nanach songs, over and over, and then H"Y blessed me with a new givald Yiddishe Nanach song which B"H I'm going to record soon. Bney Brak got a little taste of Nanach. Of course the children were really excited and alot of them got free stickers. The adults also were quite inspired B"H.
While in Tel Aviv, parked on a side road, Hazamir pulled up in his Nanach car, and while we were delighting in his arrival Ronain and his whole Nanach van crew pulled up as well, and great happiness descended from heaven, and we were all dancing and celebrating Nanach for a few minutes, - I took a short video clip - before everyone move on to spread the light to the masses. B"H besides for all the amazing hafatza, I was zoche to hear some givald novelle insights, e.g. the esoteric secret of the letter formation of the first word of the Tora, Beraishis, whose letters can be rearranged to spell Aishes Rebbe - Rabbi Nachman's wife! Which is amazing because almost nothing is known about her, she must have been the epitome of modesty! (the Zohar also says that Beraishis can spell "Rosh Bayis" - the head of the House, and according to the Talmud, a person's wife is considered to be the house. Rabbainu is the "Rosh" the head, as is well known, and Bayis is his wife!). Yosef Nanach, the star of my first animation movie, also shared an amazing insight he had based on the story from Ancient Times of the Prince and Servant who were swapped, which talks of the country which was called The stupid land with a smart King, then the king died and the country was called, The Smart land with a stupid King, and it had to be restored to the original name. If we understand that the King is an allusion to Saba Yisroel, this can open our minds to understand a little what's going on today! B"H have a few clips which I will upload as soon as I can get a good connection. love these stories...keep postin, they give tons of chizuk !! !